This one is going straight on my “Do Not Want” list. 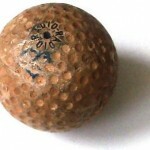 Apparently, back in the good old days of 1910, the Worthington Golf Ball Company produced golf balls with a radium-laced core. Known as the “Ball of Mystery that never loses life or shape due to its inherent radioactive properties”, this bad boy was supposed to travel farther than the competition. Check out the original advertisement. Maybe if the CIA had replaced Kim Jong Il’s ball with an exploding one of these back when he was shooting 9 holes-in-one we would have been rid of him much sooner.